Mir Misbahuddin, is Professor of Pharmacology in the Faculty of Basic Science and Paraclinical Science, Bangabandhu Sheikh Mujib Medical University, Dhaka, Bangladesh. He received his MBBS (1979) from the Mymensingh Medical College under The University of Dhaka, and PhD (1988) from The University of Tokushima School of Medicine, Tokushima, Japan. He joined as Associate Professor at the Institute of Postgraduate Medicine and Research, Dhaka in 1993 and was promoted to Professor in Bangabandhu Sheikh Mujib Medical University in 2001. His research interest is to find out the drug for the treatment of arsenicosis. In addition, he is conducting clinical trials and bioequivalence study. He is, currently, the editor of Bangladesh Journal of Pharmacology. He was the editor of Bangladesh Medical Research Council Bulletin, Bangladesh Journal of Physiology and Pharmacology, Teachers‟ Association Journal. His keen interest is in the field of both asynchronous and synchronous virtual pharmacology. In asynchronous teaching, a student can use the teaching contents from a website at anytime, from anywhere and several times. In the synchronous teacher, he is trying to arrange live lectures for students of Pharmacology at under – and post-graduate level from home and abroad. He edited six books on his subject. 1. Why did I Decide to Write this Book? I considered deeply who will be the reader before deciding to write this book. When you look at the Indian history of educational system, guardian sent his child to the teacher’s house (Gurugriho) for learning. Subsequently teacher shifted his class from the house to under a tree when the number of students increased. Later on, teaching was limited to textbook and brick-based face to face teaching at classroom. At present teaching contents are available in internet. Arsenic contamination has changed our concept of safe drinking water. We failed to motivate our people, politicians and beurocrates to understand the risk assessment process that other risks to life and livelihood are as grave as arsenic. A lot of information is available about arsenic and arsenicosis in internet. Reader has less time to read those and sometime confused which are authentic. 2. Who is the Reader? Doctor working in the arsenic endemic area will be the reader of this book. How I became a Toxicologist? I joined in my present working place as Associate Professor in 1993. The research activities in our department were mainly focused on the therapeutic effects of spirulina, a blue-green algae. High concentration of arsenic in the drinking water as well as case of arsenicosis was first diagnosed in Bangladesh in 1993. Two to three years were required for official recognition of this disease by the Government of Bangladesh. In 1997, one of our MPhil students showed interest to examine the curative effect of spirulina in arsenicosis as a part of his thesis work. At that time we had no facility for the estimation of arsenic in water or urine. We, then, started to use the qualitative method (Gutzeit’s test) for the presence of arsenic. Then we conducted an open trial on a few cases of arsenicosis with spirulina, which is available in our drug store as alternative medicine. Therefore, we purchased spirulina powder and then provided to patients as a part of treatment because there was no specfic treatment of arsenicosis. Surprising results were obtained when we saw the clinical improvement after 4 months of treatment. That study was not well designed and we did not estimate the amount of arsenic in hair or nail. Only urine of the patient was examined for the presence of arsenic in order to confirm the diagnosis. Then I thought how spirulina relieved arsenicosis. I placed some spirulina powder in an ordinary syringe (5 mL) and placed vertically like a column chromatography. I poured some amount of arsenic contaminated water at the top of spirulina powder and then collected water sample in a test tube placed at the bottom. The water sample was then tested for total arsenic level. Arsenic was not found when it passed through spirulina. Then my idea was shifted from spirulina to water hyacinth. As arsenic is present in underground water in Bangladesh, but not in surface water like pond or river. Pond contains a lot of water hyacinth. Like spirulina, water hyacinth may have an important role in removing arsenic from pond’s water. I collected some water hyacinth and placed in a bucket containing arsenic contaminated water. Again I surprized to see that water hyacinth removed arsenic from water within a few hours. 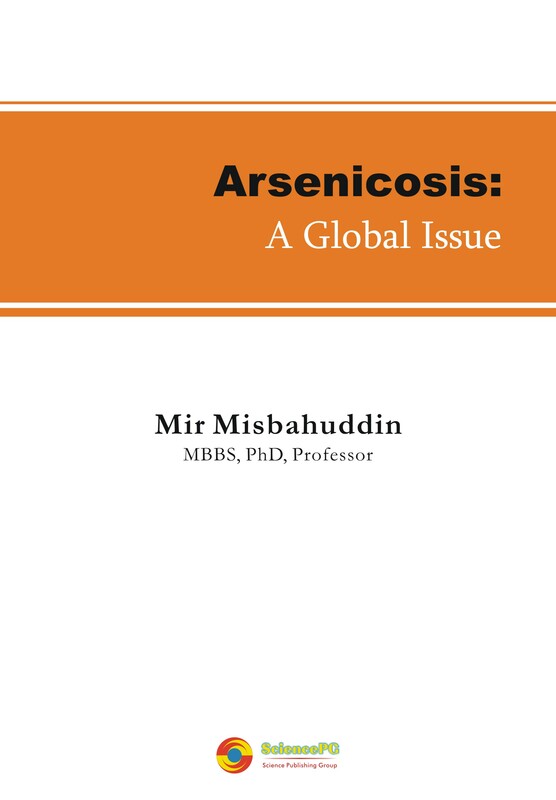 When I go through the published articles on arsenic, I found that Bangladesh is severely affected by chronic poisoning with high concentration of arsenic. Most of the research works were done on epidemiology and mitigation. Only a few papers were on the treatment of arsenicosis. Then I decided to start research to find out a drug that will be effective for the treatment of arsenicosis. I changed my laboratory setup that is gradually shifted from the Gutzeit’s method to other methods using spectrophotometer, atomic absorption spectrometer (AAS) and atomic fluorescence spectroscopy (AFS). 3. What Initiates me to Write this Book? One day I received an email from the Science Publishing Group to wtire a book. Then I decided to write a book on arsenicosis. I wanted to solve a number of questions that had been raised in a scientific saminar on “Arsenic: Health effects, mechanism of action and research issue” held in September, 1997 at Maryland, USA. I wrote two arsenic related books. These previuos experiences helped me in writing this book. A lot of information is given in this book. Only the future will tell what percentage of the information in this book is correct.